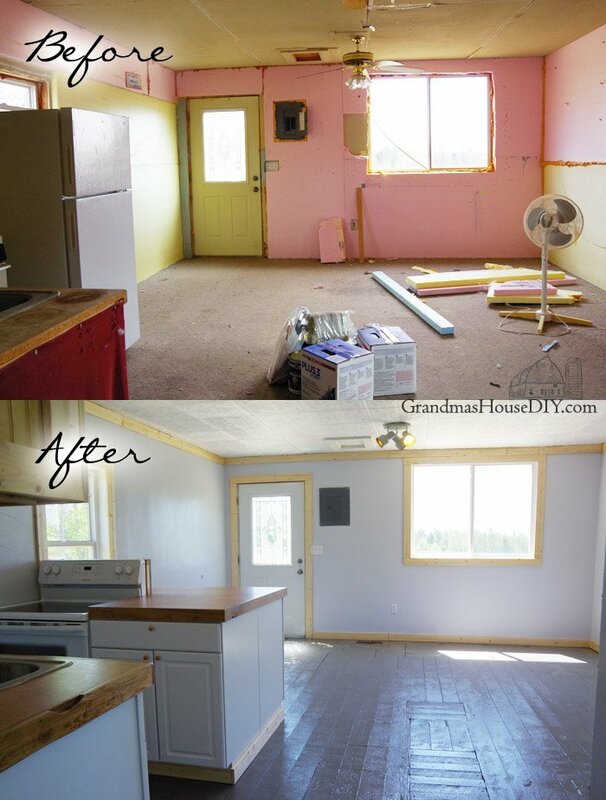 I am so excited to finally show you guys the before and after of the entire little house remodel! It took me about fifteen days in total to get this place up to snuff and around $3,000 to complete it. I had a serious plan and took a few hits when that plan collided with reality – I also tried a new product (styrofoam ceiling tiles!) for the ceiling in the main room and in the bathroom. I also purchased the most expensive plywood I have ever purchased (nearly $100 for a sheet!) that my husband helped me cut and get into place in the kitchen for the counter tops. First a little history (feel free to skip this paragraph if you’ve been following along…): On the lot beside us this little place (all of 500 square feet) has gone through many “renovations” since my Grandpa built it over 60 years ago. It was built for my Grandpa’s dad and then it also housed my Grandma’s dad for awhile. Way back then it didn’t have running water and was as simple as you can imagine: just a 300 square foot box with a dirt floor basement beneath it. Literally decades later my dad and brother dug a septic, a well and added a bathroom, a closet and a bedroom, insulated it, sheet rocked it and gave it new siding and shingles and added a little kitchen. They also poured concrete in the basement and carpeted the floor down there to increase the living space. I remember several friends and family living here on and off over the years (including my brother when he was first married) and then my dad lived here for the last ten years after my folks’ divorced. There is really only one thing you need to know about my dad to completely understand the state of this place: He doesn’t care what anything looks like, he doesn’t like paying bills, cleaning is not his strong suit and the man apparently believes that Everything can be fixed with spray foam. EVERY. THING. Hence: eight inches of foam board glued to the walls, windows bulging with 6-8 inches of spray foam around them and the entire house is still covered in cat hair from a cat that’s been gone for many years. Let’s take a trip down memory lane to what this place looked like before I tackled it. My main goal was so simple: Bring back in the light of day! Seriously, two windows were totally covered up with foam board! I only realized one of them even existed when I walked outside the house to get the plan on paper. I had no intention for this little home to be “feminine” or “girly” at all. (The Universe knows that I’m not much of a girly girl…) But to me it actually turned out quite lady-like in its own way. Everything is so light and airy now, the house feels twice as big as it did. They always say that it is amazing what paint can do and this little place is definitely testament to that. Between primer and a couple different shades of paint all in there were over twelve gallons put on this little house in different applications. 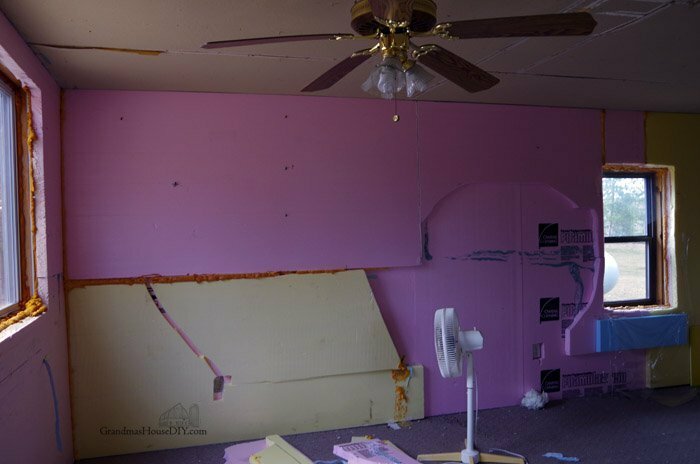 The walls also received over 60 pounds of sheetrock mud. (Yup it was like working in a tropical jungle for a couple of days while all that moisture dried.) I used a technique with the mud that I’m calling my “pallet knife” application, it turns out looking like stone, or concrete… or something. Well it is definitely different and certainly won’t be everyone’s style but with how those poor walls were DESTROYED by glue and foam I decided this technique was our best chance to save them in the least amount of time as possible. It is two heavy coats of mud with NO sanding, just smoothing as I go. I’ve done this before and, actually, I wish I had just done this in my house too. It only took me about eight hours to do the whole house and then I was ready for primer and paint. 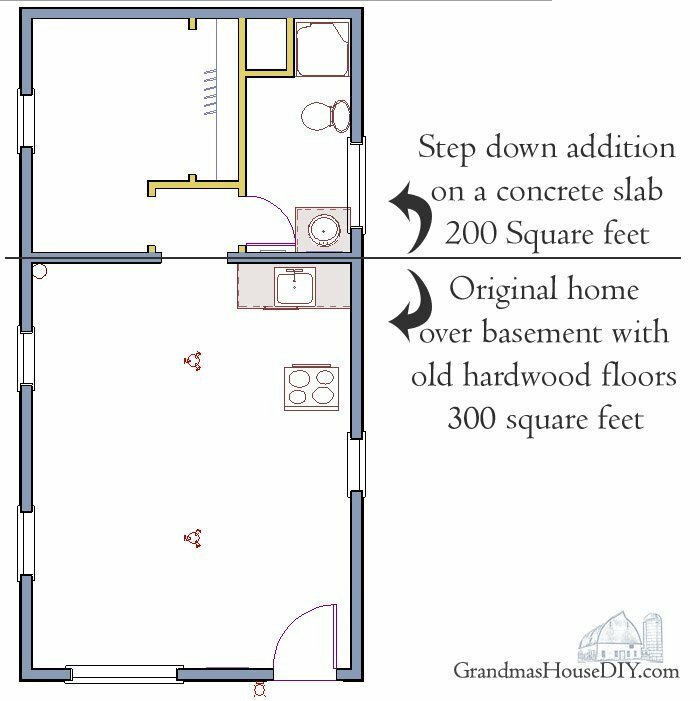 I laid down linoleum floor tiles in the bath, hallway, bedroom and bedroom closet over the concrete slab. Check them out here on Amazon. Linoleum stick down tile is actually not my favorite thing to work with however the price is so incredibly good on them that there didn’t seem to be a better alternative and, quite frankly, I think they really turned out nice! 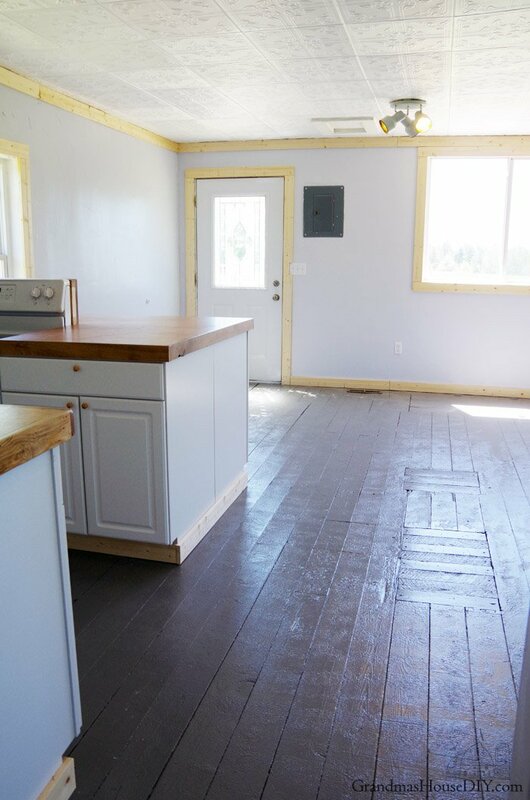 I love how the floors turned out in this little house! Those are 60 year old tongue and groove pine floors. Are they perfect? Heck no! I even had to patch the middle of them with some barn wood. They are incredibly my style and, after two coats of primer, three coats of paint and four coats of poly acrylic, they are also practically indestructible! 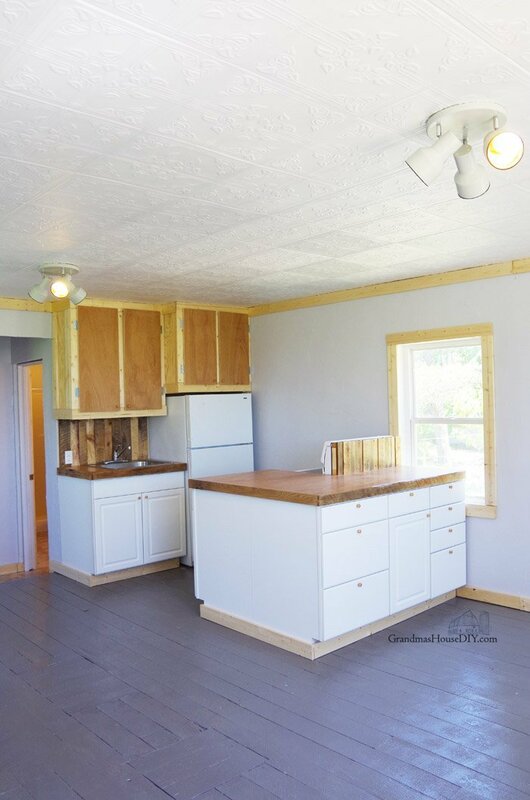 I built the upper kitchen cabinets out of pine and we purchased stock white Menards cabinets for all of the lowers. The cabinet doors and counter top are made of mahogany veneer plywood that my husband helped me cut and get into place. 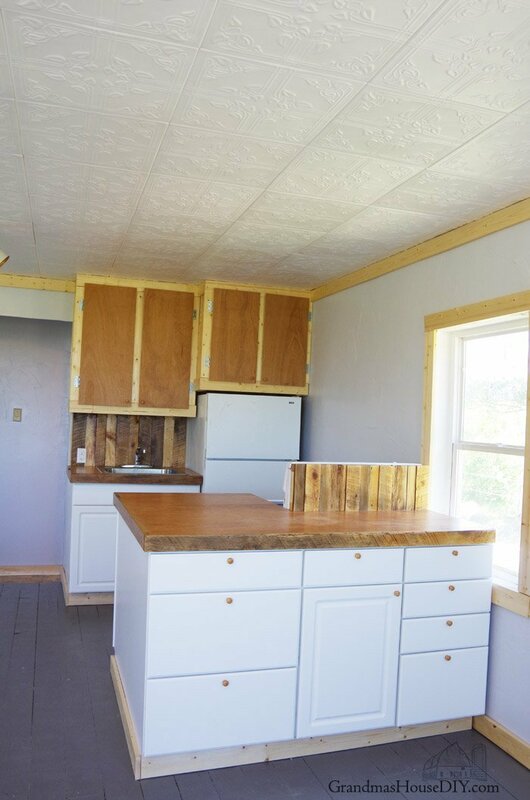 To tie it all together I added barnwood (from our barn of course) to the backsplash and behind the stove as well as little wood knobs throughout. (those knobs were only $8 for 20 of them!) 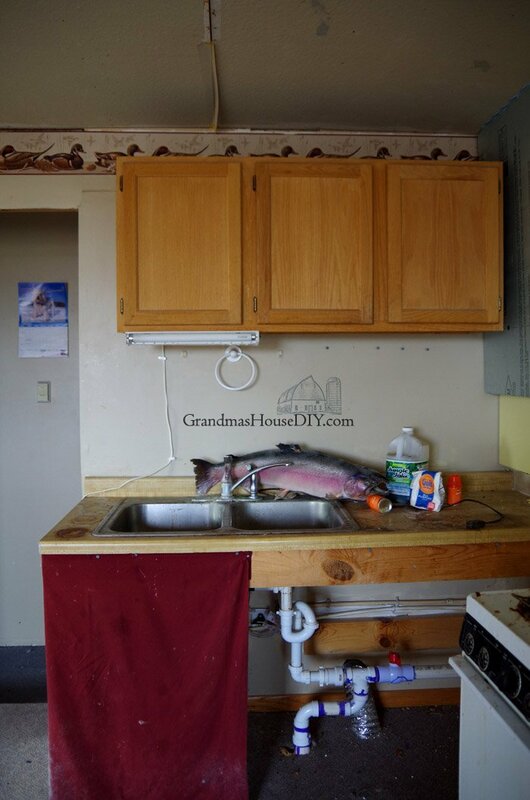 Above the kitchen sink I built a utensil hanging rack and, get this, my Grandma’s fifty year old light from her kitchen that still works great! The bedroom was the room that needed the least amount of work, just taking down the foam board to unearth that window helped this room out dramatically! 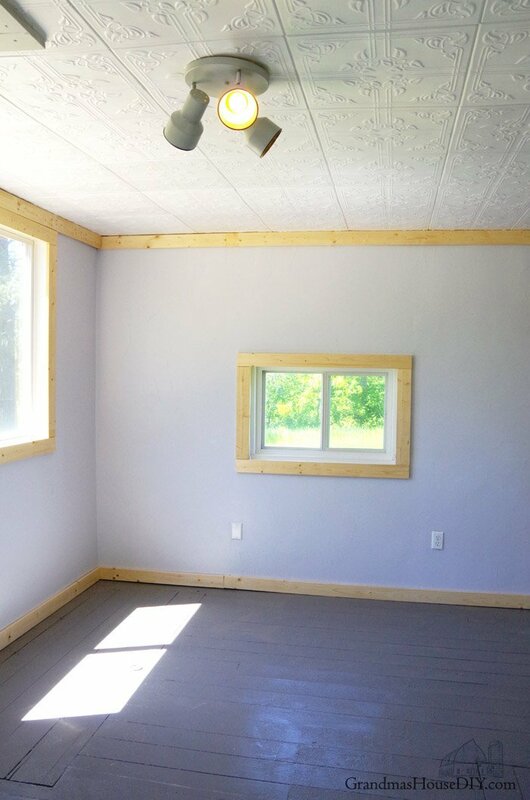 A new light fixture, trim, paint and new floors and this room looks 100 times better. Whoever put the plumbing in (I.E. that horribly placed bathroom sink drain) clearly never thought there would need to be a door on the bathroom. 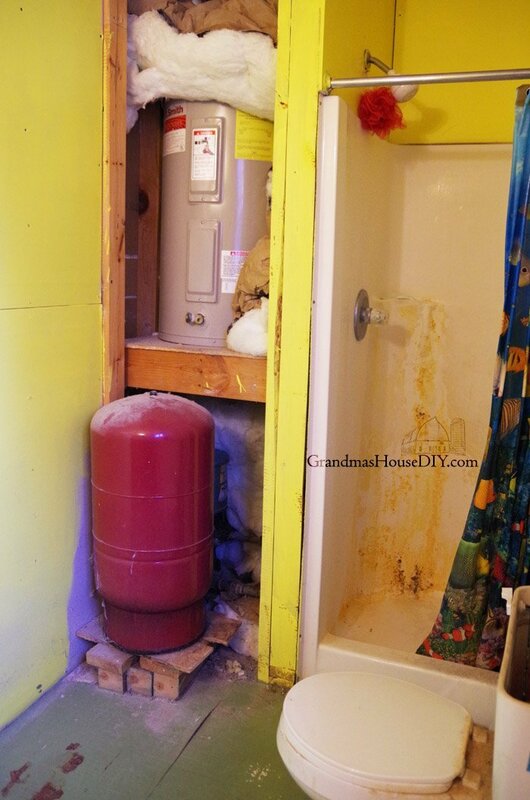 There was just nothing I could do about the door hitting the drain so it will never open all of the way because the only alternative was to either cut the door or jackhammer out the slab to move the drain two inches. (The “hall” was just too small to have the door swing OUT into it so flipping the door around wasn’t an option either.) It remains one of those things that will always bug me that I’m just going to call “character” for lack of anything else that I can do. 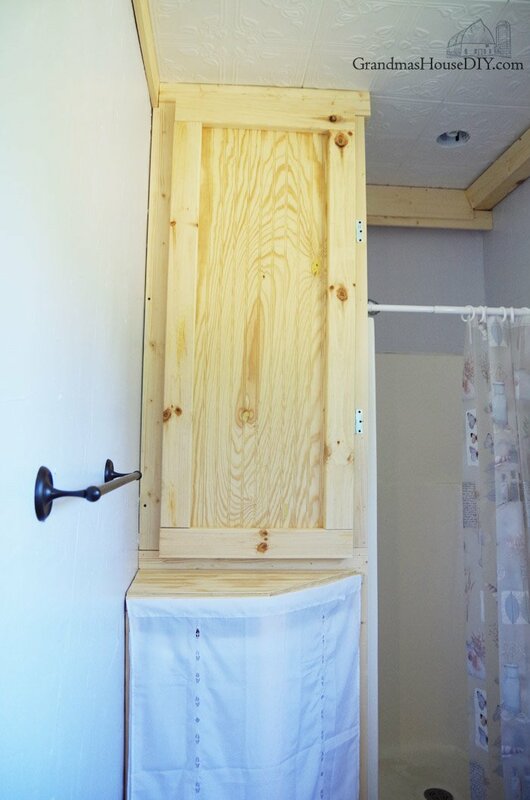 I added yet more wood to the bathroom to cover up those two drain pipes by building a “shelf” that we figure we’ll put a waste basket on top of at some point… or something. To add insult to injury this bathroom is actually really quite big, if they had moved the drain to under the window it would have easily accommodated a double vanity! Now it is simply the perfect example of how you can take a decent sized space and make it incredibly inefficient and impractical. I had given myself ten full days to get this house done or, at least, that was the amount I took off from my day job to get MOST of it done. 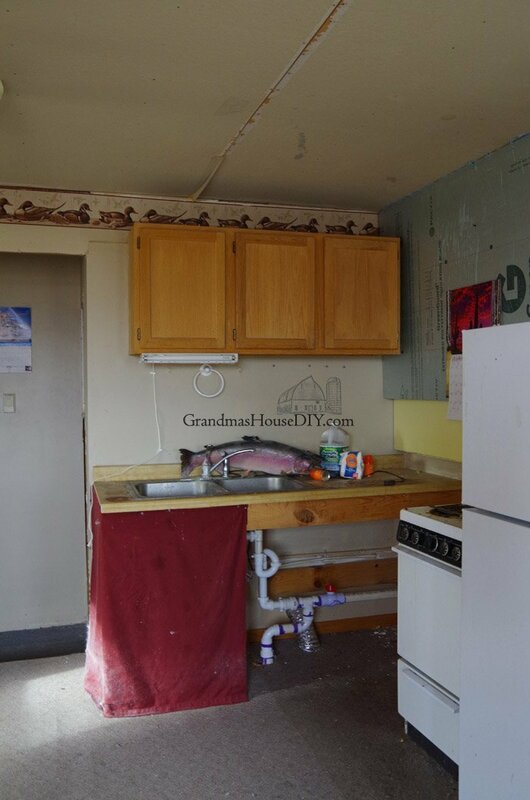 After those ten days it was a waiting game for the lower kitchen cabinets and bathroom vanity. I would guess it was probably another total five days all together after that as there were a few afternoons I took to putter around, touch up etc. Not to mention time spent tinkering here and there on the weekends too. The trim was the job I underestimated the most: both in material and time. I felt like I was trimming this little house out FOREVER and I had to make a call twice for yet MORE 1x4s. It was crazy but not surprising, I did the same thing getting our own home trimmed out. It was a really great moment when I was able to take my miter saw home for good and get it out of there and, yes, I danced after finally putting up that last piece of trim! If anyone had told me just how much time I was going to spend on this little house caulking I simply would not have believed it. I caulked the ceiling tiles up, I caulked around the shower (and in a ton of places in the bathroom) I fixed all of the windows with even more caulk, I added caulk to help stick down some of the linoleum floor tiles and after nearly thirty tubes of caulk you would think I would be good at it by now. I’m not. Caulking is NOT something I am good at. As I mentioned before this little house feels feminine to me now, maybe its because I (a lady) did the majority of the work and a lady (my mom) hired me to do it. But I think its more then that, I think it was unconscious actually – this place was SUCH a bachelor pad for SOOOOO long and it just screamed brown and dark when we first walked in it: Seriously, it had a duck wallpaper border! I don’t think we meant to go in the exact opposite direction but that is definitely where we went. I am very happy with it 🙂 It feels (and smells!) so clean and nice now, it also feels so much bigger it is almost hard to believe! And, of course, my favorite thing is that it is still the little house, we didn’t cover the 60 year old wood floors because they weren’t “perfect” instead we let them shine. And that’s true of a lot of things here. This old place was built by my grandpa and I was able to bring in my grandma’s old kitchen light and a whole bunch of wood from his old barn, anything less and it just wouldn’t have been right. Such an amazing transformation! What a gift to your mom too, to know that her daughter did this for her. 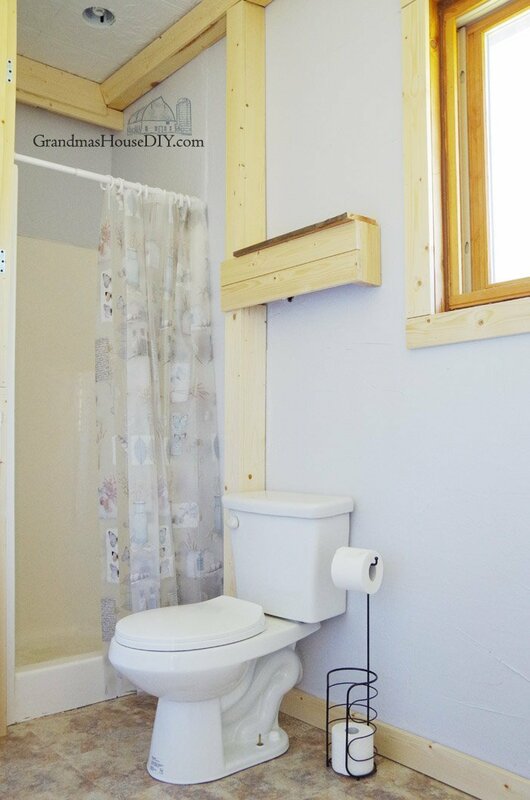 I wondered if you could fit a pocket door in the bathroom rather than one that swings open? We have one to our mud/laundry room & I love it. Mine is inside the wall but maybe you have space to add one that works like a barn door? Just a thought. What about a bi-fold door? Hey Sandra, I think that might be the ticket! We’ll see how it goes and if we can’t stand it anymore lol then we’ll look into bifolds! I love it. I watch the Tiny House Show all the time, they have fantastic ideas. When you get it furnished can we please see a picture. Keep up the good work, it became a treasure. Gloria, I’ll definitely be posting more about the little house, we have it all furnished now with thrift store finds but many of them need some work so that’s going to be my winter projects! So much work, how did you know where to start? I have been reading along as you tore it apart, did the ceiling tiles. 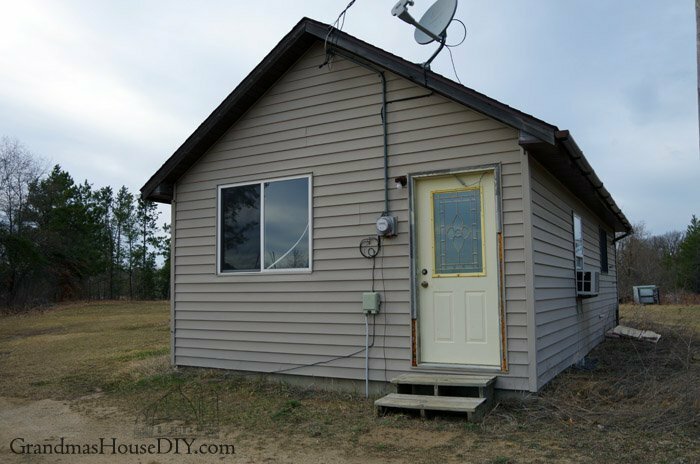 You basically redid everything except the outdoor siding. Obviously its night a day different and you can be really proud of your job. Congratulations. Thank you so much Leanna, it really turned out pretty well I think considering where it came from! It was time consuming but I’m so happy to be done! Thank you so much and YES I am very relieved to have it done! Glad to read your post wrapping up the incredible job you did making this into a livable home again. (yes thank you to your helpers too, they sure helped keeping the job in the timeline you were working with). Wow huge transformation Tarah!! Respect to you for sticking it out! Your dad sounds so funny. I too have seen plenty examples of foam gone wild in my house… ouch! Thanks Mary! Yeah its easy to get carried away with spray foam I guess lol! Wow! Talk about a top to bottom inside out project! Great job! I love this! What a transformation, I feel like it actually even looks bigger with the great neutral clean color scheme you have going on. Love it! Thank you so much Askley! Oh gosh…this looks so great!! Wow…….you should be very proud of yourself, what a big job and what a transformtion but what a great thing to do. Love the ceiling tiles, so pretty! How neat that you have your Grandmothers house and furniture. Blessings to you, hope you have much joy and delight in living there. Thank you so much Nellie – I can’t wait to go thrifting to furnish it! You did a great job with a lot of sweat and a tiny budget! Congratulation! I really want to see an outside shot with the new door color, too! Thanks Julie! Yup as soon as we get the outside cleaned up a bit I’ll add that before and after of the door too! Wow! That looks amazing! You did such a great job. Lol well I’m sure you guys would fit though I don’t know how comfortable you would be! 😉 But you would be totally welcome for a visit, thanks Kate! What a transformation! The house looks infinitely better, and I can’t believe all that work was done in roughly two weeks’ time. Thanks so much for sharing at the #happynowlinkup! Wow – it looks really fantastic. Your Dad sounds a lot like mine. He has no interest in what his home looks like or even if it’s clean. Your hard work has really paid off! Thanks JoAnne, yeah a part of me totally understands my dad but that house ended up so gross and bad lol every night I went home and I cleaned something! This Is an incredible renovation, especially considering you completed it in just 15 days. Congratulations!! You breathed new life and love into this house. Congrats on a beautiful renovation! Such an improvement! It looks so much brighter and fresher! I can’t believe you did all that in just 15 days! It turned out really well. I have been thinking about buying an unfinished cabin to put at the family place in West Texas. Your post let’s me know​it is doable, yet daunting. I want to insulate well and know that the electric and plumbing need to go through before insulation. Sheetrock is not my friend, as caulk is not yours. Lol. 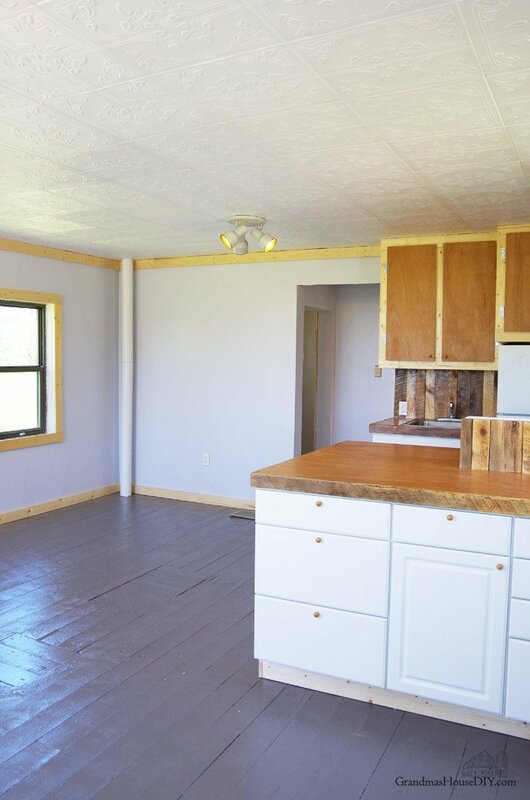 Can you give me any ideas as to what to put up for walls other than sheetrock? And as far as the ceiling I love the idea of the styrofoam but I’m not sure what to put up over the insulation, any ideas would be greatly appreciated. 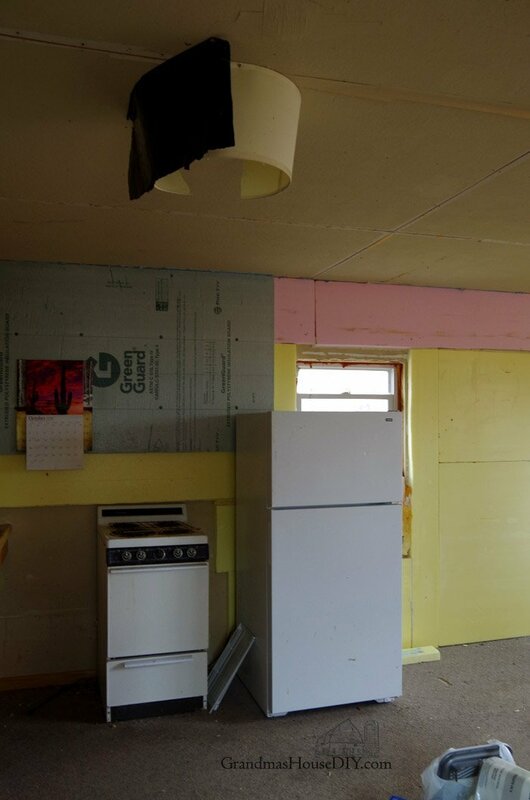 Hey Sonya, we decided to use spray foam insulation in our home because it was only 2×4 walls and 100 years old, it was VERY expensive but it has definitely paid for itself many times over! Other then spray foam though it is not as mandatory to get all the electrical and plumbing done before you insulate, especially if you’re doing it yourself. I actually found if your using fiberglass batting its easier to get all the batting in first and then run your electric and plumbing through/around it. As far as sheet rock alternatives unfortunately there are not many and they are a LOT more expensive then sheet rock. But if its a small place it might really be worth it for you! 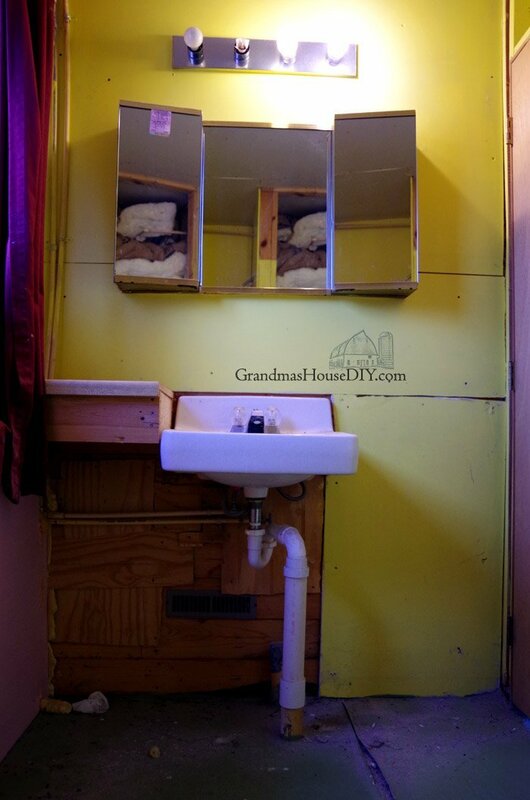 There’s the old school look of wood paneling, you can flip it over though and use the smooth back side of it and paint it, I find it really can look pretty darned good if you do that. Or even if you use the side with the grooves in it and paint it, it really isn’t as bad as everyone makes out. Beadboard is an option, I used that on all of our ceilings, it is expensive at around $20 for a 4×8 sheet. Tongue and groove (or any kind of wood board or board and batten) is an option too and that would require less labor. Hope that helps! Good luck! Sonya, car siding might be an option. It gives the look of barn siding and can be painted any color you like. Sometimes Menard’s will have it at a pretty good discount or you can get it on one of the 11% discount weeks and use the savings rebate for something else. It’s tongue and groove so will slide together and will give a rustic look if that’s what you like. We have a new 16 x 24 shed that we’re working on and we’re doing the floor with what is basically the same thing except it is salvage from the roof of an old, old garage we tore down. Ran it through the planer to smooth it all out and make it the same thickness. My husband has wired the whole building up for lights and outlets even though we don’t have electricity out there yet. I haven’t decided what the walls will be yet as it will be a multi-use building for garden tools, potting, and who knows what else. I am so impressed…. great job!!!!!!!!!!!!!!!!!! I cant wait to see it decorated. It is a great little house, you did a wonderful job. Looks so different and bright. Great job!!! Is this going to be a rental or? Thank you Nancy! For now it will be our little guest house but my mom ahs plans on selling her place and while she’s building her dream home, this will be where she lives! Tarahlynn, I’m sure my husband wishes I had your power tool skills! What a transformation — your mother must be so proud of you! Taralynn, you are my HERO! It is a whole different place. You made excellent job! You did such an amazing job, wow. I am so incredibly proud to be a woman right now Tarah. You rock on so many different levels. Well done. I’m sure a long line of past generations of strong, determined woman in your family are cheering and smiling from ear to ear seeing what you did here. Michelle, thank you so much! I also come from a line of many strong and ubber stubborn ladies! I learned from them that the only thing us ladies can’t do is what we’re not willing to do 🙂 After that its just about determination! WOW! You did an amazing job! It’s a cute, clean and very nice space now. Congrats!! Great job! Lots of love, sweat and tears and decisions are obviously in your grandmother’s old home. Congrats! Question: Why did you patch floor in opposite direction of floor? Suggestion: Why not run a floor to ceiling shower curtain? Hi Gale! Thanks so much! Because of the way the joists ran it was a much easier endeavor to patch the floor in the opposite way and, I figured, it would look like a patch regardless of the direction it ran so I opted for the easier solution! And I’m on the lookout for a tall enough shower curtain, for now this was the best that walmart offered lol! That looks great, loved seeing ll the befores and aftes. Thanks for sharing at the Dishing It & Digging It Link Party. We loved reading it. You should have your own show! That is absolutely incredible. I’m ready to move in! Thank you so much Amrita! The floor is my favorite too!! You did an incredible job making your little house livable. 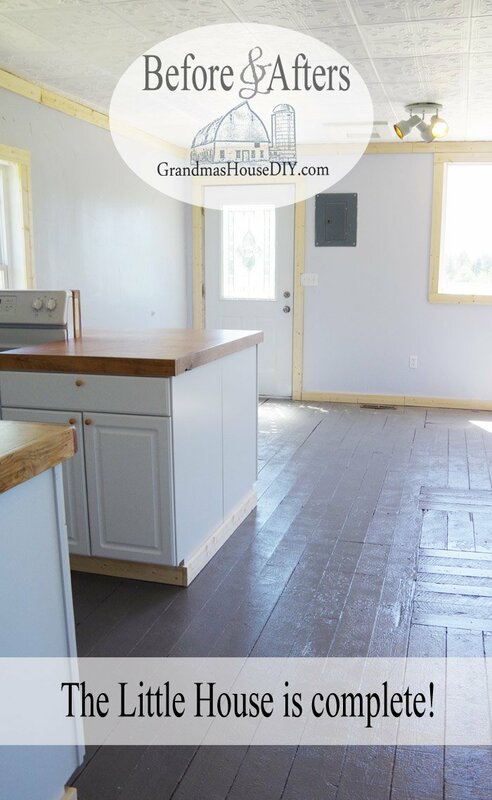 It’s so great that you were able to preserve the original floors that your grandfather put it. I love the ceiling tiles. They are pretty and they cover up a multitude of sins. The transformation is amazing!!! You did a great job!! You did an incredible amount of work, here, and the results are fantastic! I commented a few weeks ago when I first saw this post. Thank you for linking up at The Blogger’s Pit Stop. I’m sharing your link on social media. Let’s give this wonderful transformation a feature on the Blogger’s Pit Stop. I’ve always known you had some serious DIY skills, but you outdid yourself on this project! My goodness, girl, is there anything you can’t do?? 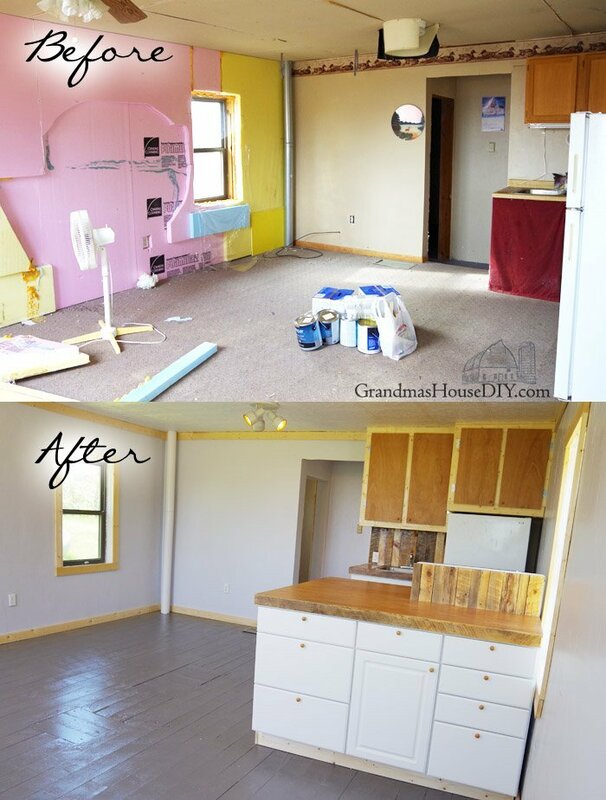 Congratulations on transforming this sad space into a lovely little house! Oh thank you so much Richella! I am a firm believer that with total stubbornness we can accomplish almost anything lol! Wow! Kudos to you. This is an amazing transformation. I would love to see it all done up with furniture and artwork etc. I love the countertops in the kitchen! Thanks so much Michele! We’re working on furnishing it right now, can’t wait to show it to everybody! What a wonderful transformation, and I love that you saved a piece of of your family’s history. It’s clean, bright, adorable, and will definitely make a cozy little home for the person lucky enough to live in your labor of love. I guess I am a bit confused?? 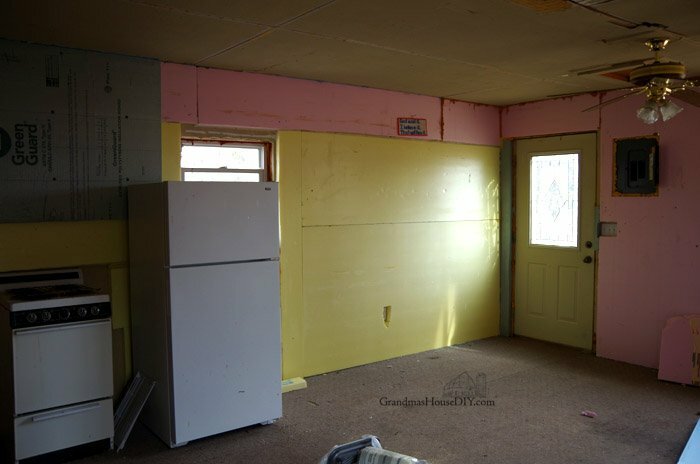 (not unusual…lol) but are you going to paint all the trim you put up? For me…it would make the space look even larger?? Or maybe I missed something?? You did a GREAT job!!! 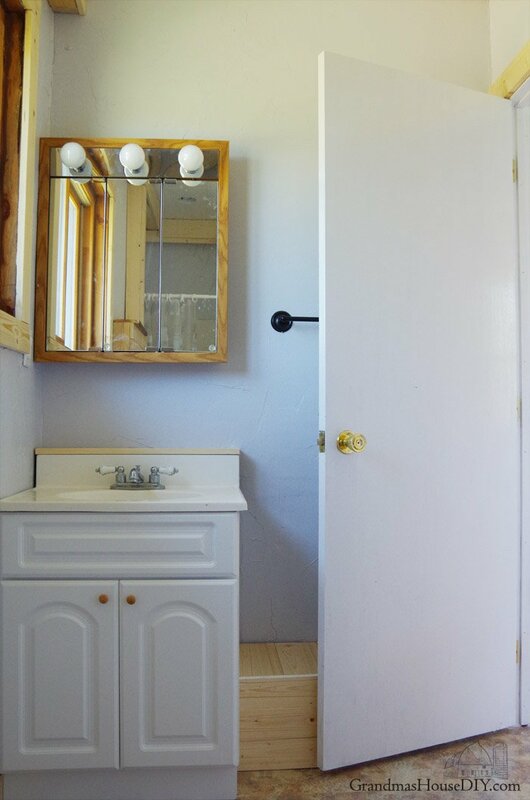 I think a barn door for the bathroom would give it lots of character!! If not inside bathroom, sliding across hall would look pretty good!! Fabulous job!!! Cant wait to see it decorated!!!! Hi Paulette, we ended up deciding not to paint the trim mostly due to time restraints! Maybe someday I’ll paint it all white because you are SO right, it would brighten up that place even more! Thanks for coming by and reading! Hey Tarahlynn, love the little house makeover. Can’t wait to see it all decorated! Its hard to find a small house with such a long history in a family, so many generations lived there and made it their own. But you seem to be the only one who is sincere about making it a better place and your did a brilliant job, it looks much better and a livable place. Thank you so much Ron, it definitely means something to me and my family to hold on to our history! 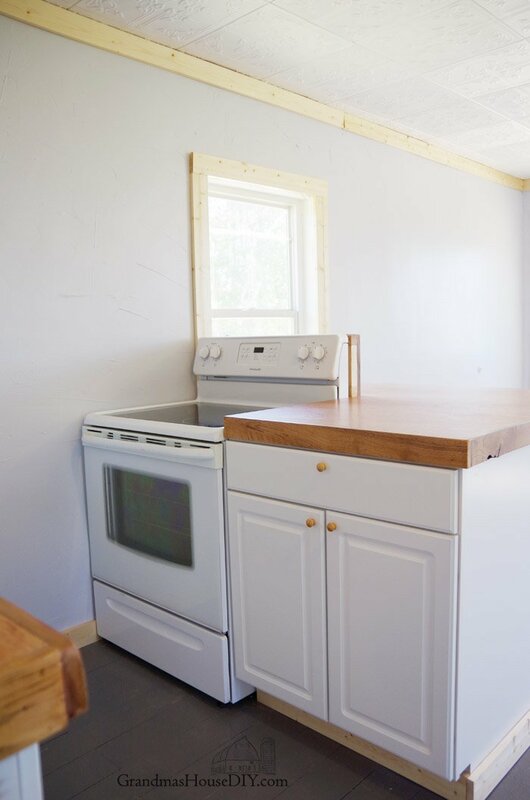 Great job, just wondering why you didn’t paint the upper cabinets white to match the others? It looks a bit unfinished to me. Not trying to insult you, just curious! BTW, I love your blog but geez, where does all that energy come from???? You’re amazing! Hi Violet, oh my goodness we talked and talked about painting those white! The upper cabinets I built from scratch, the lowers we purchased as is but we decided to leave the uppers because the upper doors I made out of the same wood that I used for the counter tops, thought keeping that tie together helped bring everything together a bit more. I still wonder if we should have painted them though lol. Thanks so much coming by! I think you did such an awesome job. Love the wood backspash! Did you varnish or use another sealant? I love all the touches! I admire your tenacity. Deborah I used MANY coats of poly acrylic! 🙂 Thanks for coming by! WOWOWOW! LOVE the transformation! I found your blog through the #WonderfulWednesday blog hop. 🙂 Thanks for stopping by! You need to do a teardrop camper next 🙂 Really is amazing work!